The Ford Ranger just returned to the U.S., and we are already hearing rumblings about the next-generation version of this midsize pickup. Most of the speculation surrounds the U.S. arrival of the Ranger Raptor stateside, this will also include a redesigned 2022 Ford Ranger lineup. According to reports, the current Ford Ranger Raptor is not and never will be for U.S. consumption. But there are internal rumblings that Ford’s global team is hard at work on a new platform that will underpin the Ranger and Bronco. The same reports indicate this platform will also underpin a U.S.-ready Ranger Raptor. It’s unclear what changes Ford will make to the new-generation Ranger, but Ford will likely stick to an evolutionary redesign to avoid throwing off its newfound customers in the U.S. As for the Ranger Raptor, we expect much of the same additions as the current model has relative to the base Ranger. That translates to wider front and rear tracks, a significant suspension lift, flat-black body cladding, and an exclusive grille with blocky “FORD” lettering. 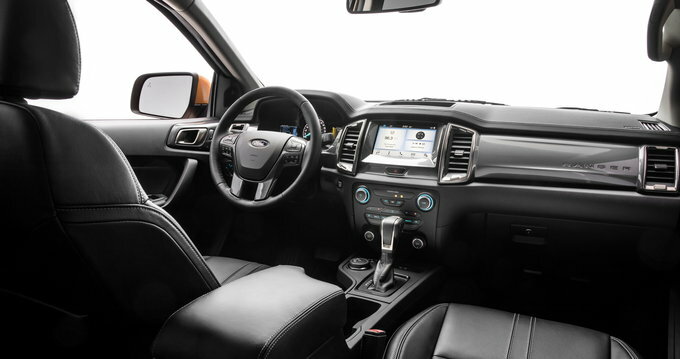 Under its hood, we see no reason for Ford to abandon the Ranger’s current powertrain, which includes a turbocharged 2.3-liter four-cylinder with 270 horsepower and 310 pound-feet of torque. Ford may make a few modifications to bring power up or fuel consumption down, but this engine has plenty of good life left in it. Ford may see an opportunity with a diesel option, given the Colorado and Canyon each offer this, but the jury remains out on getting a solid oil-burner in place that can pass strict emission laws in the U.S.
As for the Raptor, Ford is likely to abandon the model’s current diesel engine. The replacement remains unclear, but the 335-hp 2.7-liter turbocharged V-6 found in the F-150 and Edge ST seems a good suitor. The current Ranger has the automatic emergency braking the IIHS likes and optional blind-spot monitors and adaptive cruise. We expect the 2022 Ford Ranger to keep all this and add any other new goodies the automaker comes up with between now and its release. Safety in specialty vehicles like the Ranger Raptor can be tough, as too many nannies take away the fun and too few can lead to poor safety scores. Fortunately, the F-150 Raptor sets a precedent by offering all the F-150’s safety goodies as standard or optional equipment, so we expect the Ranger Raptor to keep safety a priority. There is no official release date set for the 2022 Ford Ranger. Check back for updates. Pricing also remains uncertain, but barring huge changes, we expect to see only inflation-based price increases relative to the current Ranger, which ranges from $25,195 to $39,580 (destination fees included). Depending on where the 2022 Ranger Raptor falls in the lineup — in the middle like the F-150 Raptor or as a range-topping trim — this could push its peak price up a bit. The 2022 Ford Ranger will compete with the Chevy Colorado, GMC Canyon, and Toyota Tacoma. We have partnered with trusted dealers in your area to give you a great price on the new Ford Ranger. We have information you must know before you buy the Ranger.